Why Hillary Clinton’s big Super Tuesday wins are great news for Democrats. High turnout among black voters catapulted her to victory—and could send her to the White House. 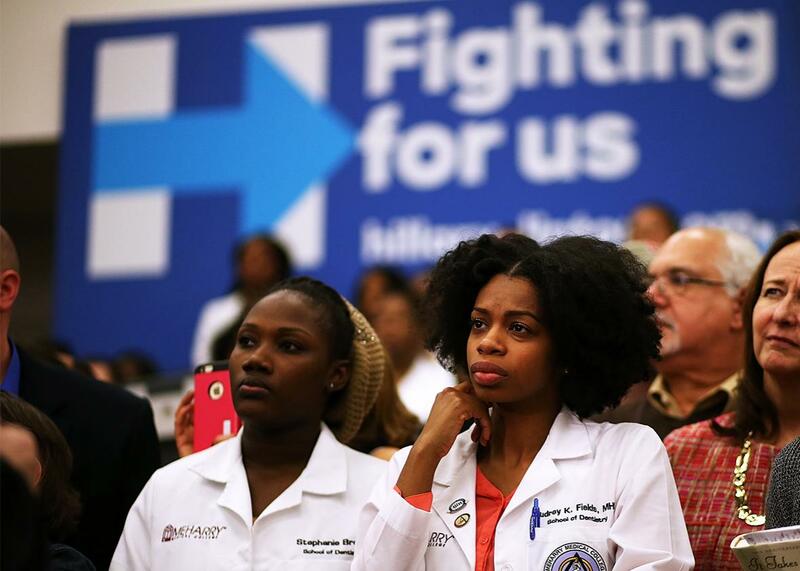 Supporters look on as democratic presidential candidate Hillary Clinton speaks during an event at Meharry Medical College on Feb. 28, 2016, in Nashville, Tennessee. When the first Super Tuesday polls closed in Virginia, Georgia, Massachusetts, and Texas, one thing was clear: Hillary Clinton would have a great night. Riding momentum from her South Carolina victory, Clinton scored big wins in each state. And as with last Saturday, her victories rested on strong support from black voters. In Virginia, exit polls showed her winning 84 percent of blacks; in Georgia, 83 percent; in Tennessee, 82 percent; in Arkansas, 88 percent. She also scored big with Hispanic voters, winning them by a 2-to-1 margin (65 percent to 34 percent) and securing a solid victory in Texas. As of mid-Tuesday night, Clinton holds a majority of wins across the map, excluding Vermont, Oklahoma, and Minnesota, where blacks—and minorities overall—are a smaller share of the Democratic Party and the electorate writ large. In Massachusetts, where minorities represent a modest share of the Democrats’ voting pool, it’s a tossup, as Sanders fights to overcome Clinton’s advantage with older Democrats. The biggest story from Democrats’ Super Tuesday isn’t the horse race between Sanders and Clinton, however; it’s the turnout drop from the previous open primary, in 2008. This fits the overall trend of this election, where Democrats are less likely to vote in the primaries than their Republican counterparts, who have turned out in huge numbers to vote for a grab bag of different candidates in a competitive and high-stakes nomination battle. It’s important to remember that the 2008 Democratic primary was unusual. In addition to the historic campaigns of Barack Obama and Hillary Clinton—vying to make history as the first black or first female president of the United States, there were the circumstances of the election: Democrats were eager to recapture the White House after seven years of George W. Bush. The result was a burst of enthusiasm, channeled by both candidates into incredible turnout. More than 36 million people voted in the Democratic primaries, or 19.4 percent of all eligble voters; Democrats set turnout records in 26 states, fueled by women, minorities, and young people. The party couldn’t repeat this performance for 2016. In Iowa, New Hampshire, Nevada, South Carolina, and the Super Tuesday states, turnout was down substantially from the heights of 2008. Democrats just aren’t excited to choose a successor to President Obama, even with the prospect of the first female president and the presence of an authentic populist who has stirred younger voters and the party’s left wing. On the surface, this alarm seems well-founded. If high turnout in the 2008 primary presaged high turnout in the general election, then low turnout should do the same. But when you compare past primary turnout to outcomes in the general election, you don’t see a pattern. Before 2008, Democrats had their highest ever primary turnout in 1988, with nearly 23 million voters at the polls. The winner, Michael Dukakis, eventually lost to George H.W Bush in a landslide defeat. Likewise, high GOP primary turnout in the 2000 primary—more than 17 million Republicans voted versus 14 million Democrats—didn’t guarantee an easy win: George W. Bush lost the popular vote. Primary season turnout isn’t a reliable guide to general election results. But that doesn’t mean we can’t learn something from it. If there’s a consistent result in the Democratic primaries thus far, it’s this: Everywhere black voters have had a chance to vote in significant numbers—South Carolina, Georgia, Virginia, etc.—they’ve either come close to or exceeded their 2008 vote share. In South Carolina, blacks were 61 percent of the electorate versus 55 percent in 2008; in Georgia, they were 49 percent of the electorate versus 51 percent in 2008; and in Virginia they were 25 percent of the electorate versus 30 percent in 2008. And just as they’d backed Obama in 2008, they backed Hillary Clinton by similar margins this year, delivering supermajorities—almost 90 percent in some places—to her campaign. It’s not wise to extrapolate these results to a general election, either. We can’t predict black turnout or vote share from these numbers in the primary. But we can say this: After years of speculation over black voters and their participation—will they turn out for Democrats who aren’t Barack Obama?—the answer is yes, they will. What we can see from the 2016 results, thus far, is that two presidential cycles of this successful contact had an effect. Not only are black voters increasingly regular voters, but unlike many other Americans they also seem to believe in their efficacy as voters—that, if they organize and vote, they will change things for the better. If true, this is a powerful turn, and not just in the Democratic primary. If black voters believe that they matter, then they will turn out in the general election too. And if they turn out like they did for Obama, then the Democratic Party—and Hillary Clinton in particular—could have a clear path to the White House.